Last Sunday morning, I had the rare treat — as an Episcopal priest — of sitting together with my family in the same pew in church. We were on vacation and visiting the Episcopal Church of the Ascension in Dallas, Texas, where my brother-in-law is the new Rector. One of the things that caught my eye there was an unusual, contemporary sanctuary lamp that also incorporates into its design a place near the bottom to hold a “host box,” which is a round silver container that’s topped by a small cross. Inside that container is the reserved sacrament, which is the consecrated bread of Holy Communion. That consecrated bread — The Body of Christ — is always available to be taken to those who can’t be physically present in worship at the church, those who are sick, and those who are dying. 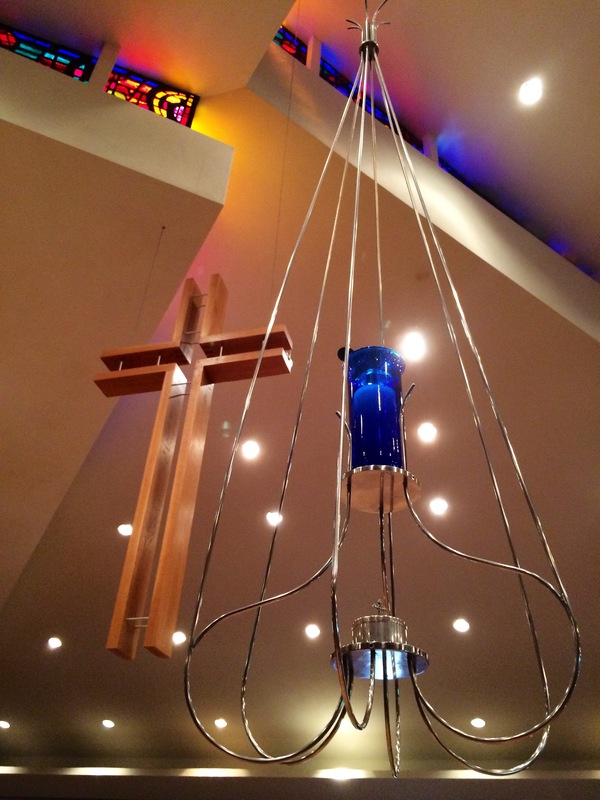 The light of this lamp is a reminder that Jesus Christ is present in that church, which is both a place and a people. That divine presence was powerfully evident in the lives of Christians who came to the altar rail beneath this sacred art on Sunday.